Once upon a time there were 4 sisters who loved toy theatres. Their names were Natasha, Louise, Claire and Kim. Kim and Natsha were twins. They decided to go for a trip to London as they heard there was a lovely shop where they could find their favourite toys. The shop was called Benjamin Pollocks Toyshop and was located in Covent Garden. 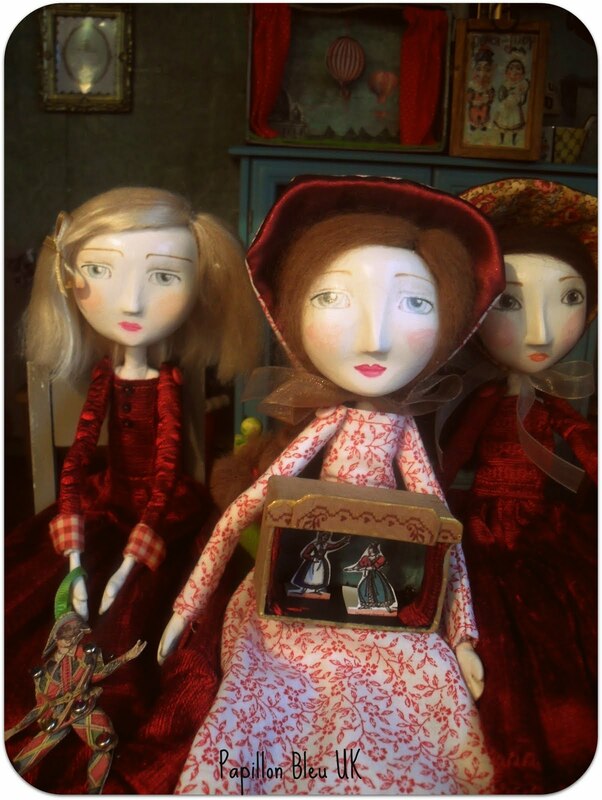 They wore their favourite dresses for the special occasion and also their favourite bonnets. Natasha never wore hats as she found them itchy and thought it would hide her beautiful fair hair. After a wonderful day spent in London, the 4 sisters had all come back with a treasure. Louise, who was the eldest, chose a lovely toy thatre so she could play and tell stories to her younger sisters. 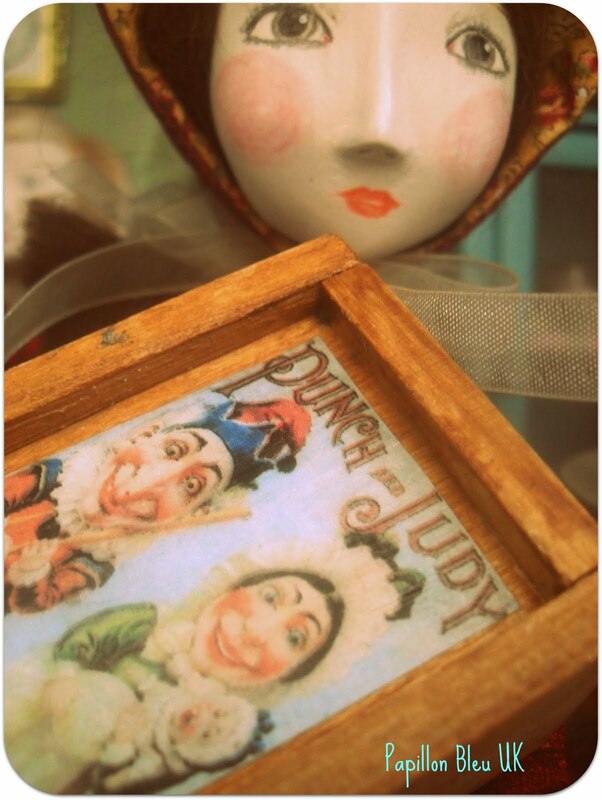 Claire, chose a treasure box decorated with her favourite puppet show "Punch and Judy". 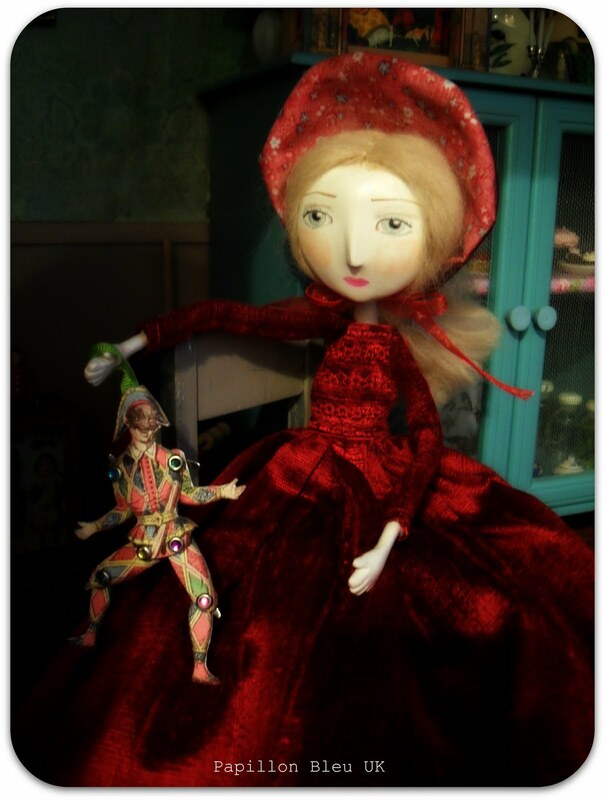 Natasha, who loved bright colours, bought an Harlequin puppet. She would play with it and hang it in her bedroom. Kim, who was only 12 minutes younger than Natasha, chose a carousel. She just loved it so much! But started having second thoughts when she looked at her twin's lovely puppet. "Will you let me play with your puppet Natasha?" "Of course Kim, we can share because that's what sisters are for." 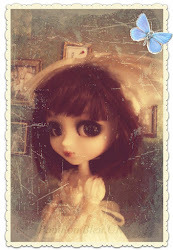 Aaaaaaaaaah if only the whole world could get on as well as dolls do! 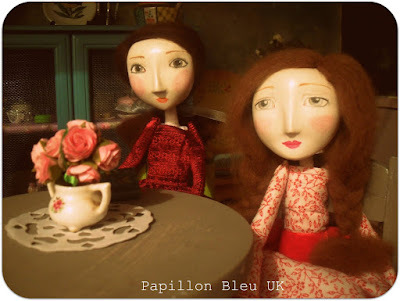 I am happy to present you these 4 new dolls initially made for a challenge on ADO . 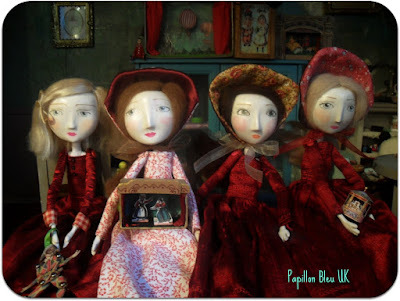 Claire, Natasha and Louise will be exclusively found at Benjamin Pollock's Toyshop ( link in sidebar). Little Kim will stay in my house. She just made my heart melt. It was a real pleasure to make their little toys. 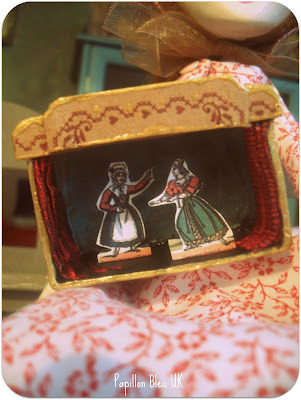 I hadn't made a mini theatre for so long! 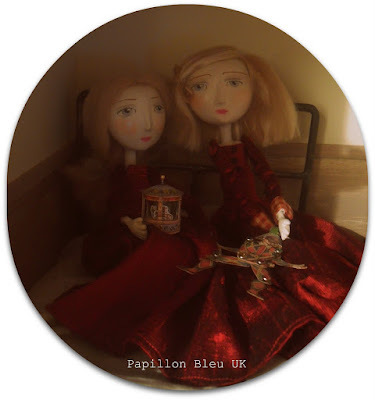 The mini carousel comes from a lovely ETSY store called Open House Miniatures. I just fell in love wit the lovely creations there. 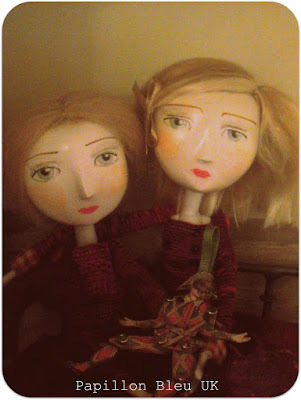 The dolls will be at Benjamin's Pollock Toyshop next week. 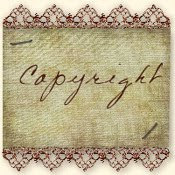 I will share photos with you! Cannot wait to take photos there. The place is so inspiring! Much love to you all my dear friends! Thanks and welcome to all the new followers. It is a pleasure to have you here. I hope you will like it in my dolly universe. Oh my, they're all totally delightful. Love the deep red of those dresses. Charming and creative as ever, Patricia! I loved their eyes! Congrats! 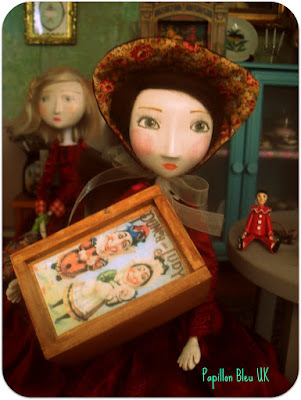 Charming dolls in a wonderful story...really lovely, Patricia. 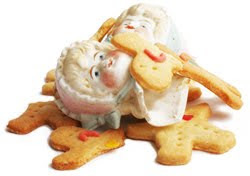 Darling Patricia, I have read all the posts on your blog that I have missed :) and what a treat it was. These four sisters are delightful. I wouldn't be able to part with even one if I were you. I love the way you have painted their beautiful faces. These dolls are treasures. Ma chèrie!!!! OH TU SAIS, tu penses comme moi! SI LE MONDE S'ENTENDRAIT comme les poupées!!! PAS DE GUERRES!! Darling, thank you for your visit. You made my morning with your sweet words and it has been too long since I have visited your perfect world here. 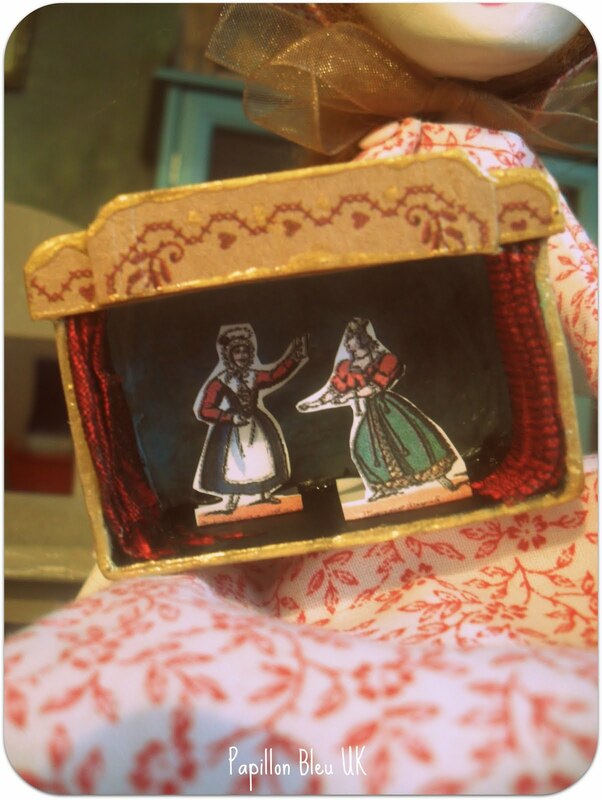 Theatres, dolls, whimsical headers with you, your dolls and an imaginary dog...what more could I ASK FOR! SPLENDID ART and love overflowing!!! Visiting from Anita's Castle site! a dear friend of mine! 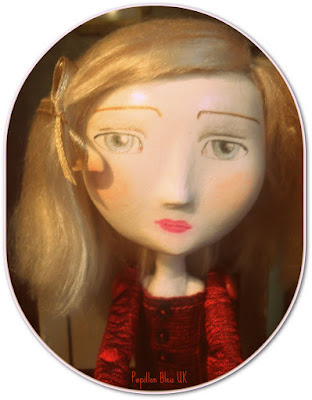 I am in love with all thing sEuro Chic over here, you must come see my Opera theatre one post from my new one pan down to the post before this one! I am going to enjoy getting to know you! Merci pour vos commentaires sur mon blog, j'aime tout ce que vous créez avec l'âme de toutes choses françaises. Tu es mon nouvel ami, je compte sur vous pour l'inspiration souvent. Merci d'avoir pris le temps de commenter mon théâtre de l'Opéra! Je vais vous visiter bientôt. Have a day filled with all things that inspire! 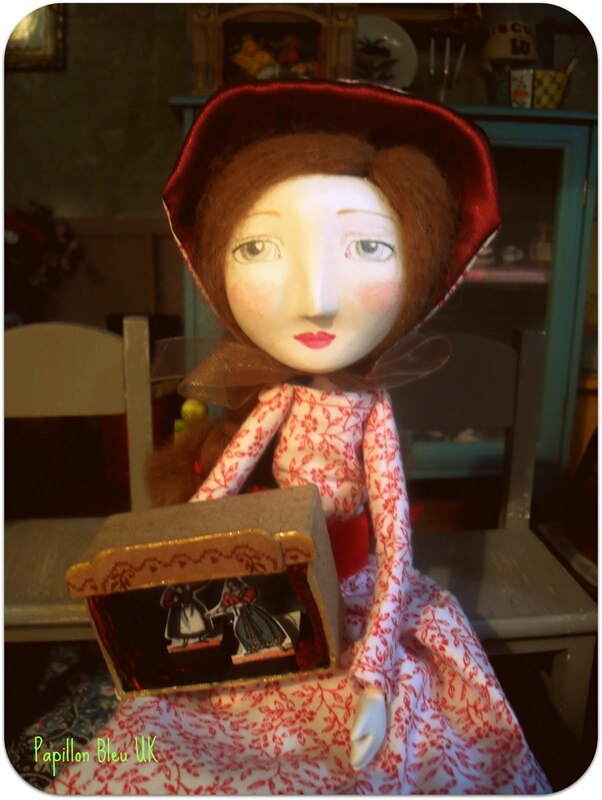 Letting your dolls inspire as they do all who visit. Quelle belle histoire! 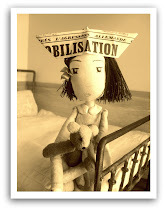 J'adore la nouvelle photo que tu as mise en haut de ton blog. Quelle bonne nouvelle, tes poupées chez Pollock's Toyshop. Bravo! Inutile de préciser que tes poupées sont superbes. Oh, you are such a dream! I want to move in with those little girls. How exciting for them to be making a trip to a toy store, in hopes of venturing to new worlds and home. So precious! ps: I made sure your name was on my list ;) It would be a tragedy if it was not! Oh, silly me! 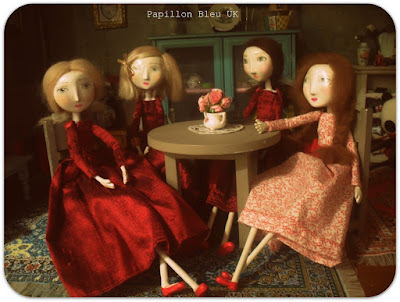 Elles sont toutes adorables :-) J'adore le rouge de leur robes, vraiment superbe! Et félicitations pour le magasin! I think I might have forgotten to tell you how very much I enjoyed your lovely book. I did. Just wonderful. You did a superb job, but I'm not one bit surprised. Chole told me to tell you she loved it, too! Beautiful sisters! Love that small theatre. 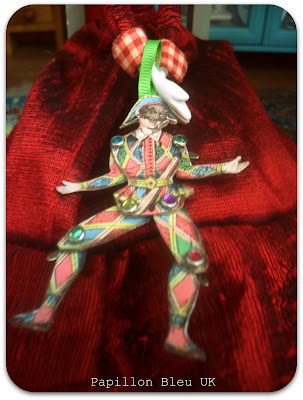 I have one of those harlequin puppets, and I think I bought it at that shop!! Patricia, you have out done yourself here!!! I love them all and the toys are magnificent. I am so happy you were able to use some of the fabrics I sent for their bonnets. They are just too beautiful for words. I so enjoy your story telling! 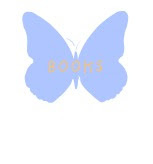 I LOVE LOVE your new banner. It's perfect! 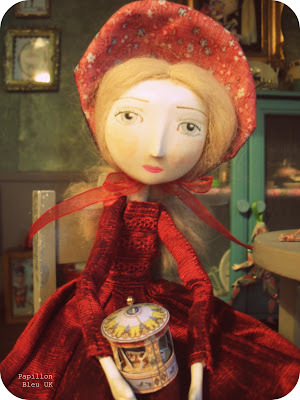 Oh how I wish I had a little granddaughter to share all of your lovely stories with. What a wonderful writer and artist you are! Thank you for visiting me and Charli. Hello Patricia! I had wondered what you might "unveil" next on your blog!------Dolls, theatre, puppets----They're delightful! 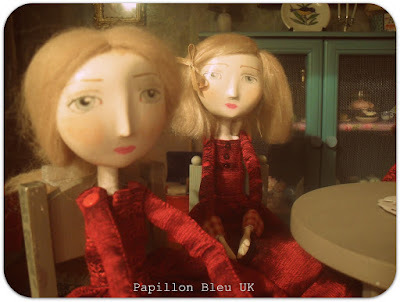 And so inspiring : ) I've been away from my own dolls, doing some work away from home, and up to my elbows in jam making! It's time to find the path back to the enchanted studio/workshop again! I can't wait to see what you found at the Toy store!! Elles sont magnifiques !!! Quel superbe travail !!! Je suis admirative ! J'espère que pour toi aussi l'été a été agréable, en attendant je vois qu'il a été hyper productif! Bravo, quel talent! Ich bin sehr glücklich Sie zu lesen! Ah... you weave such magic through all of your creations, what a constant inspiration. I also wanted to say a heartfelt thank you for the lovely and insightful comment you left on my blog ~ I've no doubt you're right and so often we're jolted into the "right" situations, how ironic. I do hope you continue to find peace, happiness & joy in your own life. These dolls are just so pretty. Love the little stories you make up, they really seem to have a personality. I clicked on your shop but no more dolls for sale. Will you be adding more soon? I would love to adopt one or two. Hoooo , cele faisait un petit temps que je n'avais pas vu tes créations .Elles sont superbes tes 4 petites filles avec leur théâtre de papier. 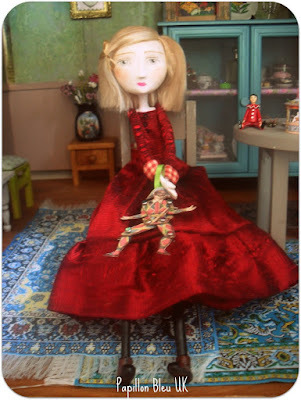 The dress up of the all dolls is so beautiful. I like all of them. Wonderful posting.